I think one of my most asked questions, is How do you manage to blog with two Children? And if I'm honest it's not something that just clicked into place, I have times when it's a piece of cake and there are other days when it's seriously difficult to get anything done or be productive - it's always worth remembering just how unpredictable life and definitely children can be, so you do need to be organised. Let's also be realistic here, blogging is not my job so it doesn't really come near to the top of my priorities, but it's something I do enjoy and have started to make an income from so there are times when I just have to focus and get on with things. 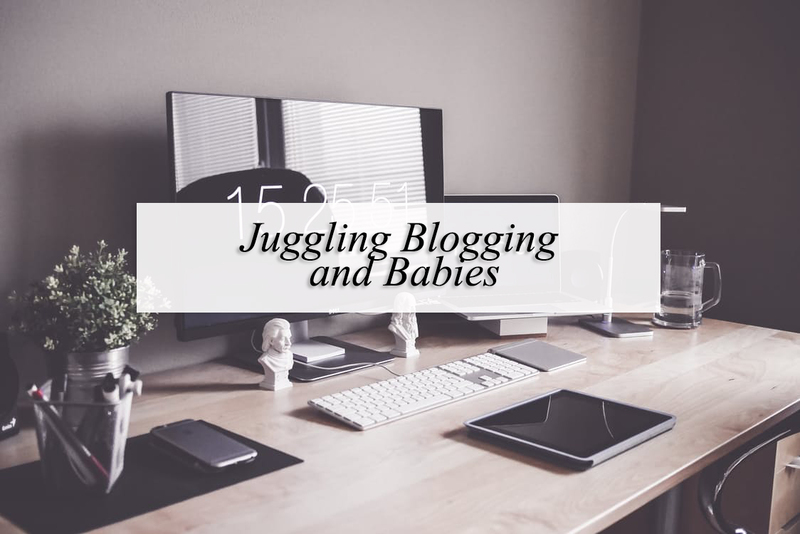 Enough rambling, I wanted to make this post to detail a few things that I found helped when learning to juggle two children, a household and a blog. Sacrifice - You have to constantly ask yourself when you're struggling for time, what is more important. When it comes to the children, obviously I don't even ask myself, it's instinct - they're first. But quite often I sacrifice sleep to stay up later and blog, now that might not be something everyone can do but in my eyes it's worth it. During the week Patrick will nap twice, once in the morning which is usually short and then once in the afternoon, that is my window to join him. I don't mind going to bed at 1am instead of 11pm, if I know I'll probably get a sneaky hour with the boy tomorrow. On a Saturday John gets up with the boys, so that's a lay in for me, which is why on a Friday night I have been known to be up till 3. Nobody remembers the nights they had a good sleep, but I will remember that I can now afford to work less hours when I return to work thanks to blogging. Utilise your day - In the evenings I like for the boys to go down, us to eat and then from around 8pm I have oodles of 'free time'. John is usually watching films, doing some work or other bits and bobs so that's my opportunity to blog. I make sure during the day with Patrick I do all of my jobs that need doing, I empty the bins, I vacuum, I clean, wash and put away clothes. They're the general jobs that before I was leaving till evening to do without the children around, it seemed silly as they're minute jobs that can easily be done with them. Bigger jobs such as deep cleaning the bathroom, windows and such tasks, I often do on a Sunday, so it really is just little odd jobs during the week. If I left all these till 8pm, it would easily be 9:30 or 10 before I'd finished and I'd have probably lost my blogging mojo. Accept help - My Nan has been a huge help with Patrick. She was having him once a fortnight or once every third week, which now they're both a bit more comfortable, it's turned into once a week. Which is great for P, he's getting used to someone that isn't me and it means I can really make the most of the time. I make sure I get up when John is heading off with him, to get Patrick all sorted and pack his bag, and then when I'm up I'll spend the morning blogging. It's always my prime opportunity for photo taking with semi decent lighting and I tend to do as much as I can in bulk. I was wasting all of these days before, going doing the food shop baby free, or watching trash tv, completely pointless as what is online shopping invented for? Dad time - I am fortunate John is incredibly hands on, But I think it's very key to share the load, when he comes home, he'll put the boys to bed whilst I cook our tea, or I'll put them to bed and he'll fold the drying. We both like to tag team so that everything is done quicker. John also likes to have one-to-one time with the boys as I get tonnes during the week and he doesn't have any time by himself, so even if it's a walk to the shop, park or just spending some time doing puzzles or reading books. They always do something together, it's usually an hour or two and if it's out of the house it's much more beneficial to me as I'm not distracted or end up going and joining in. Organisation - It's so important to be organised for me, more so in the beginning than now when I've got my groove going. I made myself a little schedule of what evenings were 'blog evenings', it was usually every other night so I could think ahead and plan better. Scheduling tweets was a huge one, I use Hootsuite and it works wonderfully for me. I'll try to schedule something every hour, a blog post, a Facebook page invite, something, so that my twitter is constantly active and that I don't have to be glued to my phone all day. And that's really it. They're not huge things but slowly over time all of them together allows me to have sufficient time that I feel like I'm in the moment with my boys, but when they go to bed I can focus on my blog. Routine with little ones is key to all of this working out, and of course this is all relative to our life but if your baby isn't sleeping till 11pm, then obviously you have no chance - hopefully if they're up late then they sleep in, in the morning. If that's the case and they don't wake till 9, you get up at 7 and start doing blogging then. Try to tweak it to suite you. Patrick naturally fell into the same routine we have for Noah, so having a second baby didn't throw everything out of the window as much as it did with a first. I can completely relate to this. I film on days when I don't have Ella or when she is napping in the afternoon, she also goes to a playgroup on a Thursday morning so I can get the food shop in & so lucky I have a hands on daddy in this house too. I hope our new little man will just slot in nicely although with my intent to breastfeed again this might not be possible! 😩 great post lovely! Struggling with this at moment as my baby never naps!! I needed this post from you - you have double the amount of babies I do and post twice as much as me, your a machine! I tend to blog in the evenings once everyone is asleep. My youngest has recently started playschool which means once house work is done I have 2.5days to myself for shopping and blogging. My hubby is great! And often tells me to get on with the blog! and he is an incredible dad too. I try to do bits through the day while little one is playing but most is done once the kids are in bed! I do a lot of my blogging like you when Jess is asleep on when I have breaks at uni which means I have to make the most of my time which is something I do not mind as I know I have something to show for it in the end.